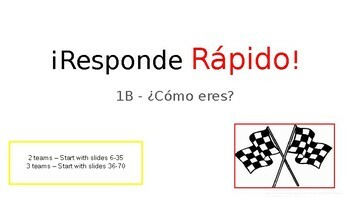 Responde Rápido is a game that we play in our classroom as a review game for the unit. 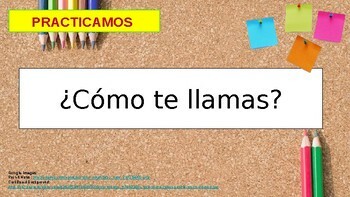 In this version, we are using the vocabulary words from Realidades 1B ¿Cómo eres? In this game, students are reading the prompts on the board and when their number is appears on the board, they are to stand up and state the answer faster than the other teams. This particular set focus on characteristics described by circumlocution. (There is a little bit of information about Victor from Sr. Wooly's videos, but if you and your students are not familiar with him, you can delete that slide). 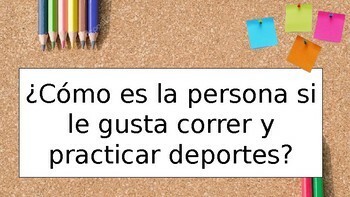 For example, "My friend is a person who likes to play guitar, and she sings and dances. What is she like? - Answer: She is talented. This way the students really need to relate activities to a personality or character trait. Now, you can make this game work for a class of 20 students, or even 30 students. You can break students up into teams of 6 or teams of ten, what ever you choose. Just be sure that the numbers on the slides match up to the number of kids you have per group. This presentation is already set up with two versions. Version 1 is for a class of 30 students (3 groups of 10). And version 2 is set up for a class of 18 students (3 groups of 6). If by chance that there are uneven groups of students, choose your superstars in the group with less students and give then two numbers to be responsible for. 1. Read the question on the board. 2. Read the number (the number will be written in word form "cinco"
3. If the number is your number, get up. 4. Respond Quickly to the question before the other team. 1. Leer la pregunta en la pizarra. 3. 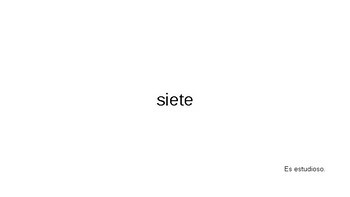 Si es tu número, levántate. 4. Responder Rápido a la pregunta antes del otro equipo. I hope that this game is of good use! My students and I love it! All pictures and backgrounds used in this PowerPoint are cited.